In this tutorial, you'll see how to weave paper strips into decorative elements for use on greeting cards. The tutorial also explores color concepts based on the color wheel. 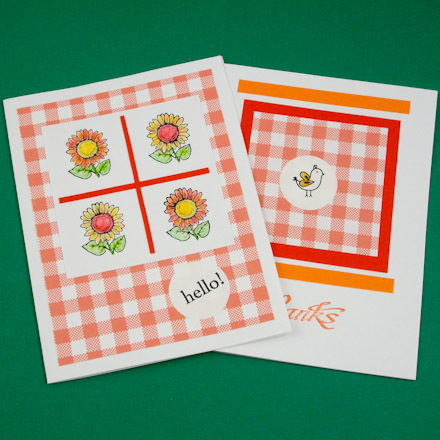 This greeting card tutorial builds on the previous tutorials, especially #1: Four Patch Cards and #2: Matted Clip-art and Photo Cards. If you are new to car- making, review these tutorials before starting this one. 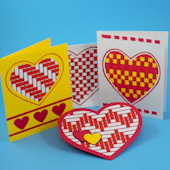 This tutorial is 6th of twelve card making tutorials and is rated AVERAGE to do. To make the card in this tutorial, you will need two colors of cardstock to weave together and another color of cardstock for the background. The colors for weaving need to contrast with each other in either brightness or color. Use light and dark papers of the same color, or two different colors that coordinate well with each other. When selecting two different colors, good choices are complementary colors or analogous colors. Complementary colors are opposite each other on the color wheel. They naturally highly contrast with each other and exude high energy. Analogous colors are near each other on the color wheel, have a cheerful effect, reflect color schemes found in nature, and create color harmonies that are pleasing to the eye. The background cardstock needs to be a color that coordinates well with the woven strips. To keep things simple, when using complementary colors for the weaving strips, a lighter or darker hue of one of the colors works well. With analogous colors, use a third color found on either side of the two strip colors. For the featured card, the colors used are considered "split analogous": that is, three colors that are one space apart on the color wheel. In this case, the colors are yellow and orange for weaving, and red for the background. Layout your colors of cardstock and select a visually pleasing combination using these color wheel concepts as a guide. Try not to overthink the color choices and let the color selections reflect what you like. 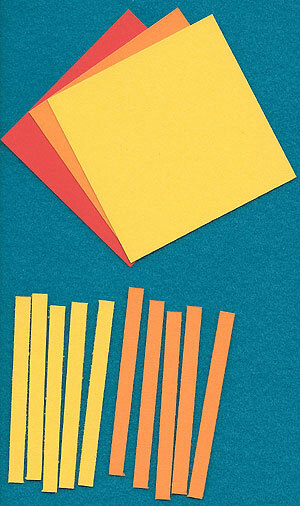 Cut 3" squares from each of the three colors of cardstock. 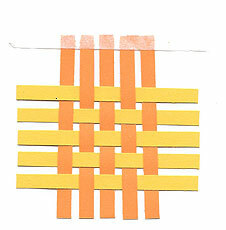 Cut five ¼" strips from each of the two weaving colors. You might also cut a few extra strips to glue around the center square as added decorations. Lay out the five strips of one color vertically, spaced evenly about an eighth to a quarter inch apart, and secure with washi tape or masking tape. Place strips with any pencil marks face-down. Tip: To reduce the tackiness of the masking tape (so it won't tear the strips when it is removed), pat it on your clothing to pick up a bit of lint. Weave the remaining five strips into the ones secured with masking tape. Weave the first strip over and under the vertical strips and the next strip under and over—alternating over and under and under and over for the other strips. Adjust the strips so that they are evenly spaced and straight. Make the space between the horizontal strips the same as between the vertical strips. Glue the strips at the crossover points around the edges of the three untapped sides. Carefully lift each upper strip to apply a dab of glue to the lower strip. Remove the tape from the fourth side and glue each intersection point. 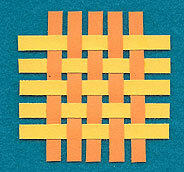 Flip the woven square over and apply glue to the remaining intersections. Trim the woven piece to about a 2½" square. Glue the woven piece to the background square, then glue to the card. 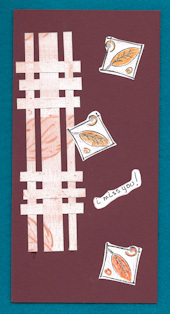 Decorate the card with the remaining cardstock using strips, squares and punches, or add a message with a rubber stamp. Tip: A quick way to get the look of weaving is to use decorative paper with a fabric pattern. Make a card like these using one of Aunt Annie's Gingham Check ePapers in either Yellow, Orange or Red-orange. 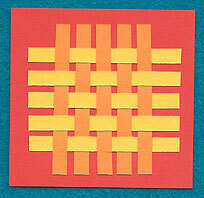 Tip: Another use of paper weaving is to back cutouts. 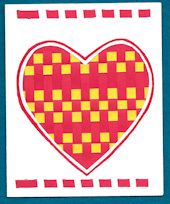 In this sample, a heart shape was cut from the card and paper was woven in a rectangle. 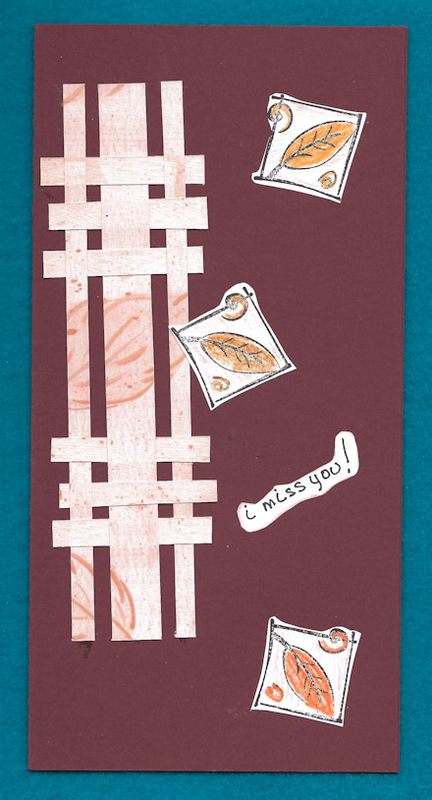 The woven piece was glued to the inside of the card to back the heart. 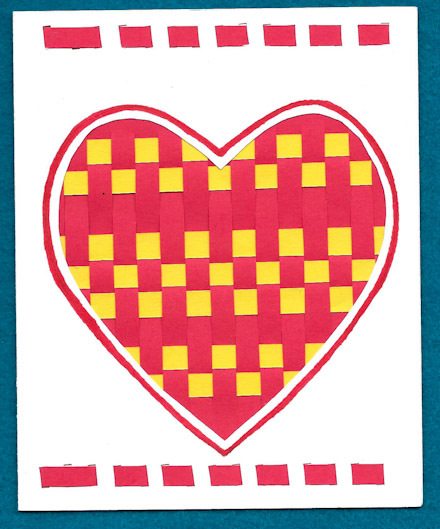 Related craft: See the Woven Heart Valentines craft project for more greeting cards decorated with paper weaving. Related craft: Use sponged paper to make this warm and breezy Sponged Paper Card. Tip: Check out the Woven Strips digital papers for examples of how to do other weaving patterns. Tip: Woven embellishments can also be made from decorative paper. 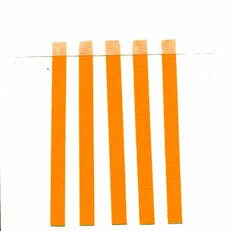 In this case, strips cut from decorative paper were used for both the vertical and horizontal strips. 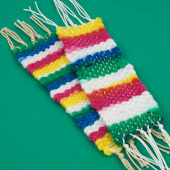 Related craft: Try weaving with yarns to make a bookmark. 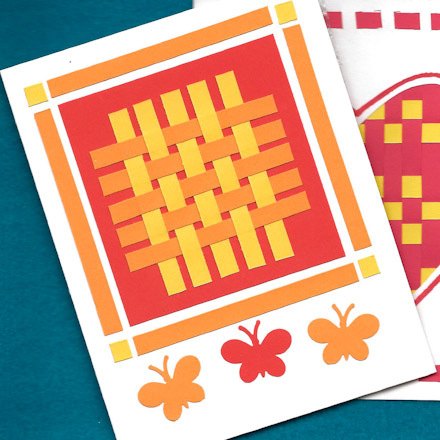 Use this simple weaving technique to make cloth embellishments for cards.